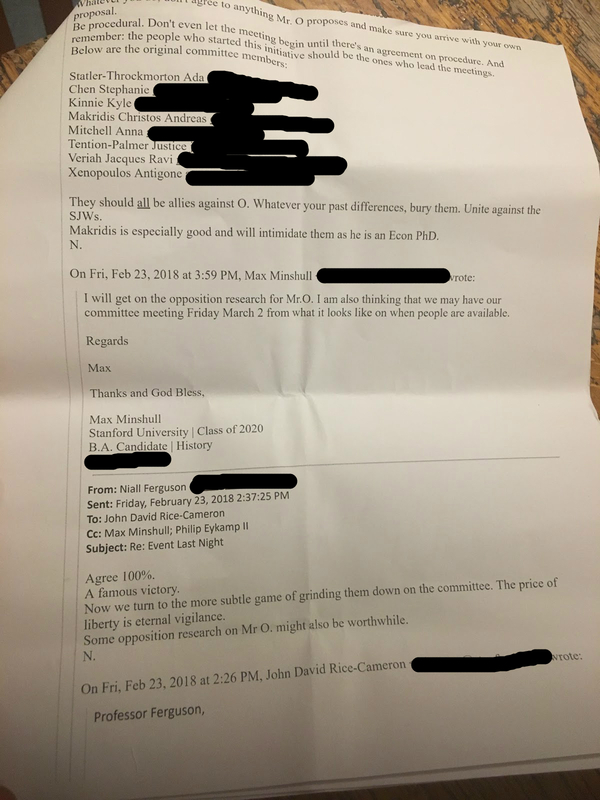 Emails between the Hoover Institution’s Niall Ferguson and well-known Republican student activists John Rice-Cameron ’20 and Max Minshull ’20 reveal coordination on “opposition research” against progressive activist Michael Ocon ’20 — referenced as “Mr. O” — and efforts to shore up support among members of the Cardinal Conversations steering committee. In 2013, for instance, he stated that acclaimed economist John Maynard Keynes did not care to consider future generations when discussing current affairs because he was gay. Ferguson later apologized for the statement. He has also been criticized for his outspoken support of colonialism and the British empire. Ocon — the subject of the emails — may be remembered for his recent ASSU executive campaign alongside Khaled Aounallah ’19, which became particularly dramatic thanks to a facetious last-minute “endorsement” from The Stanford Review that claimed Ocon had links to the conservative Turning Point USA Foundation (TPUSA). Rice-Cameron is known on campus for his role in organizing for that same group, TPUSA, as well as his role as president of Stanford College Republicans (SCR). Minshull, meanwhile, was recently in the news for his involvement with a recent “coup-attempt” of the Stanford Conservative Society, as written about by the Fountain Hopper. The emails use harsh and at times war-like language to describe liberals and “social justice warriors” (SJWs). “Slowly, we will continue to crush the Left’s will to resist, as they will crack under pressure,” Rice-Cameron wrote. “[The original Cardinal Conversations steering committee] should all be allies against O. Whatever your past differences, bury them. Unite against the SJWs. [Christos] Makridis [a fellow at Vox Clara, a Christian student publication] is especially good and will intimidate them,” Ferguson wrote. “Now we turn to the more subtle game of grinding them down on the committee. The price of liberty is eternal vigilance,” Ferguson wrote. The previous messages were interspersed with greater discussion of the Cardinal Conversations committee and planning process, as well as a discussion appearing to be about student government. In the email chain, Ferguson wrote, “Some opposition research on Mr. O might also be worthwhile,” referring to Ocon. Minshull is presently Ferguson’s research assistant at Hoover, according to Minshull’s LinkedIn profile. The Hoover Institution has in the past provided monetary support to SCR, which Rice-Cameron is president of. 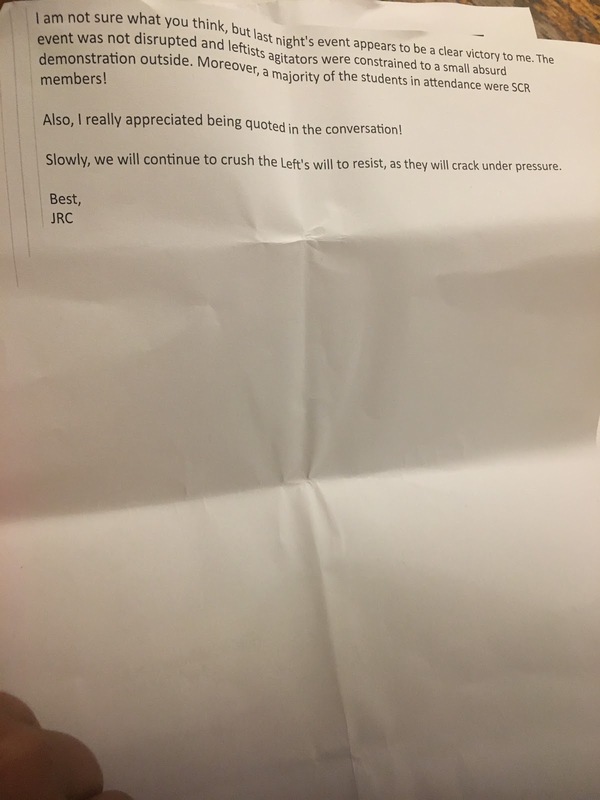 When contacted about whether that money had been in the service of the recent SCR event featuring leadership from TPUSA, Ferguson did not respond. The Cardinal Conversations program itself, meanwhile, has sparked its fair share of controversy. Its invitation of social scientist Charles Murray — who has advanced spurious claims about the relationship between race and IQ — prompted “Take Back The Mic” counter-programming by student activists. 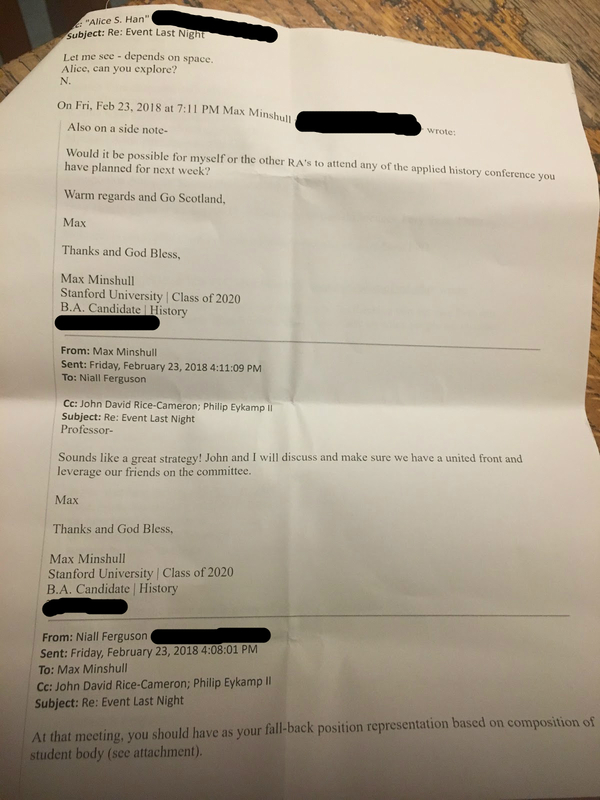 Ferguson said that he was “deeply concerned” by the campus anticipation of, and response to, Charles Murray’s visit on Feb. 22, just days before the email chain occurred. Cardinal Conversations’ student steering committee, also referenced in the emails, has drawn criticism. A February op-ed published in The Daily and co-authored by eight student groups said that the details of how the committee was formed is not publicly known. The piece also criticized the makeup of the committee. Editors’ Note: Ada Statler was listed in the email as a steering committee member based on her former role as Editor-in-Chief of The Daily. However, she declined membership after being invited to participate via email and never attended a Cardinal Conversations meeting. Correction: An earlier version of the article mistakenly stated that Ferguson was writing about “opposition research” in response to Minshull’s Feb. 23 email, when Minshull was in fact responding to Ferguson. Contact Brian Contreras at brianc42 ‘at’ stanford.edu, Ada Statler at adastat ‘at’ stanford.edu and Courtney Douglas at ccdouglas ‘at’ stanford.edu. Tagged with: Cardinal Conversation Charles Murray controversy email email chain email leak Ferguson emails Fountain Hopper free speech Hoover John rice cameron Max Minshull Niall Ferguson Persis Drell Stanford College Republicans Stanford Hoover Senior Fellow student steering committee. Ada Statler '18 is an earth systems major hailing from Kansas City (on the Kansas side, not Missouri). She's most passionate about environmental journalism, but cares about all things campus-related.